GRG J1301+5105 in LoTSS-PDR. The cross marks the host and the straight line is 10.3' long. Credit: Macario and Andernach, 2017. (Phys.org)—Mexican astronomers report the discovery of seven new large extragalactic radio sources called giant radio galaxies (GRG). The GRGs were found by visual inspection of radio images provided by two astronomical radio surveys. The findings were presented October 31 in a paper published on arXiv.org. GRG are radio galaxies with an overall projected linear length exceeding at least 3.3 million light years. They are rare objects grown in low-density environments. GRGs are important for astronomers to study the formation and the evolution of radio sources. 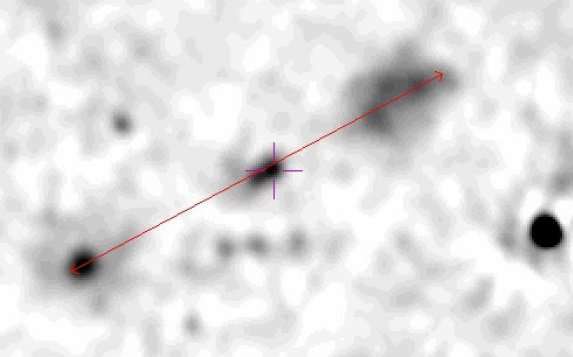 Jonatan Rentería Macario of the Autonomous University of Zacatecas and Heinz Andernach of the University of Guanajuato have lately analyzed images available in two recent radio surveys covering large areas of sky. The data provided by the Jansky Very Large Array (JVLA) 1-2 GHz Snapshot Survey of SDSS Stripe82 and the 150-MHz LOFAR Two-metre Sky Survey Preliminary Data Release (LoTSS-PDR) allowed the researchers to distinguish an impressive number of more than 2,000 extended features suggesting the presence of large radio galaxies. As a result, they confirmed the existence of seven new GRGs. "For our search, we selected two recent radio surveys that cover large areas of sky. (...) Here, we report the discovery of seven new GRGs in two recent surveys, the JVLA 1-2 GHz Snapshot Survey of SDSS Stripe82 and the 150-MHz LOFAR Two-metre Sky Survey Preliminary Data Release (LoTSS-PDR)," the authors wrote in the paper. Two of the seven new GRGs reported in the paper were detected by the JVLA Snapshot Survey, while the rest was found the data provided by LoTSS-PDR. The largest of the newly discovered GRGs, designated J1301+5105, has the projected linear size of about 8.44 million light years, making it one of the biggest giant radio galaxies known to date. Currently, with a projected size of approximately 16 million light years, the J1420-0545 holds the title of the largest giant radio galaxy discovered so far. J0152+0015 is the smallest GRG reported in the study. Its projected linear size is approximately 3.35 million light years. The rest of the giant radio galaxies reported in the paper have sizes ranging from 4.08 to 5.09 million light years. According to the study, other interesting radio sources found by the two surveys will be inspected in more detail in the future, which could reveal the presence of more GRGs, especially radio-faint and distant ones. In concluding remarks, the researchers noted that their discovery proved that visual inspection of radio images is a successful method for finding new GRGs. "Our results show that current and forthcoming low-frequency surveys with excellent sensitivity to low surface brightness features have a large potential to discover significant amounts of giant radio galaxies as well as sources of complex or currently unknown types of morphologies," the authors concluded. Extragalactic radio sources with projected linear size larger than one Megaparsec 1 Mpc = 3.09e22 m = 3.3e6 light years) are called Giant Radio Galaxies (GRGs) or quasars (GRQs). Over the past few years our search for such objects by visual inspection of large-scale radio surveys like the NRAO VLA Sky Survey (NVSS) and Faint Images of the Radio Sky at Twenty Centimeters (FIRST) has allowed us to quadruple the number of GRGs published in literature. Here we report the discovery of 7 new GRGs in two recent surveys, the JVLA 1-2 GHz Snapshot Survey of SDSS Stripe82 and the 150-MHz LOFAR Two-metre Sky Survey Preliminary Data Release (LoTSS-PDR).